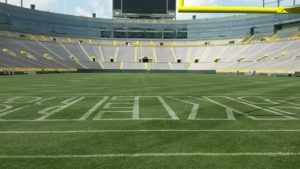 The Green Bay Packers are considering a preseason game with the Oakland Raiders in Canada, with Saskatchewan or Winnipeg topping the possibilities. Packers president and CEO Mark Murphy told the Milwaukee Journal Sentinel that they’re in discussions. “This would be a Raiders’ home game. Still kind of up in the air,” Murphy said. The Packers are scheduled to face the Raiders in a regular-season game at Lambeau Field this year. With the Carolina Panthers scheduled to play in London this year, the Packers are the only NFL team to not play in England or Mexico since the NFL launched its international series in 2007.